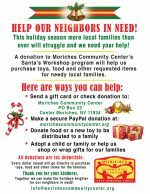 The Moriches Community Center can only survive with the generous support of people like you. You can give as little or as much as you like. We’ll be sure to put it to good use right here in our community!